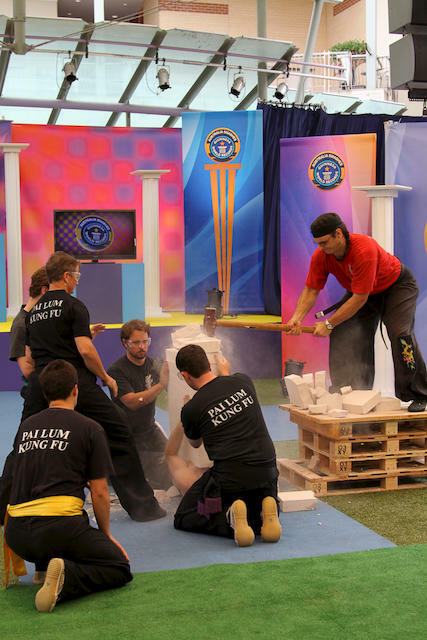 Master Hardy held the Guinness World Record for the shortest time to have 16 concrete blocks broken on his chest using a 14 lb sledge hammer. Sihr Fu Bellchambers is also in the book, as he swung the hammer! It was a real Fire Dragon Team effort, with every member's split second timing critical to the achievement. 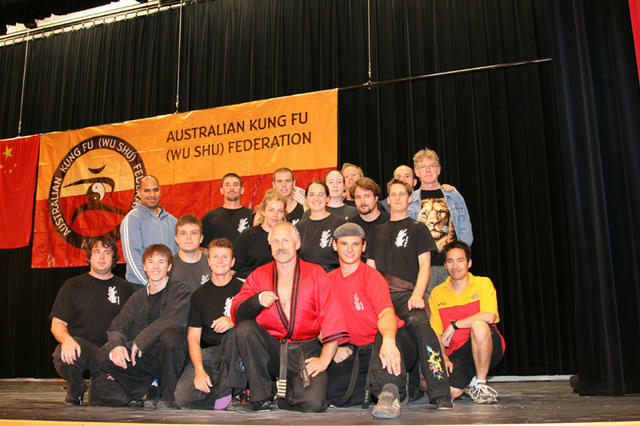 On 19 June 2005, Master Hardy headed down to the Fox Studios in Sydney, with Sifu Bellchambers, Jayne Hardy, Stephen Wells, Brendan Hayes, and David Connell. 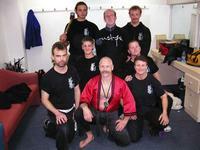 Master Hardy got in the mood with a preparatory break in front of the audience, and then the team assembled. Their first attempt was well outside the world record of 12.5 seconds, and after a brief stop for analysis, they readied themselves for a further attempt. 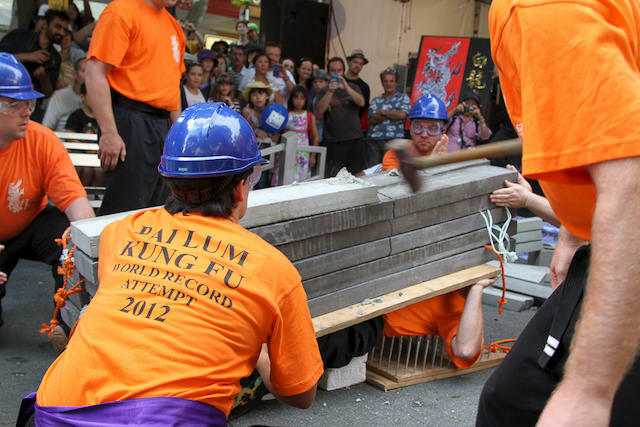 This time there were no mistakes, and the previous World Record was as broken as the concrete around Master Hardy's feet! 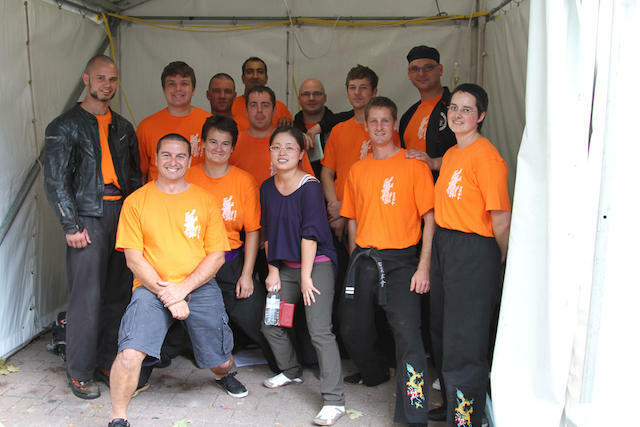 Master Hardy is sure that Fire Dragon Australia can beat their record time of 11.57 seconds again - and is set to prove this! Not content with one World Record, Master Hardy set his sights on another record, one which was to prove far more challenging. 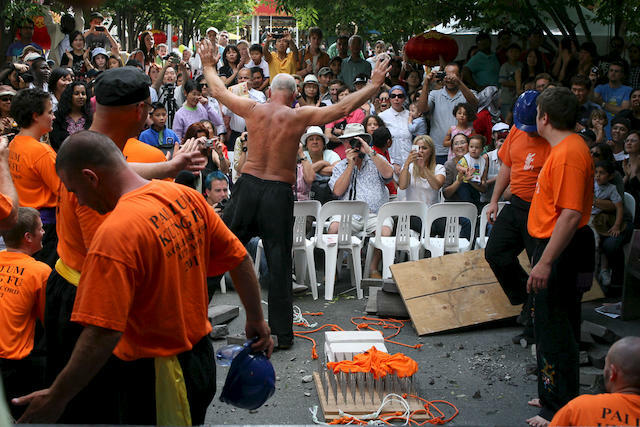 He decided to train himself to lie on a bed of nails, so that he could have concrete blocks broken on his chest. 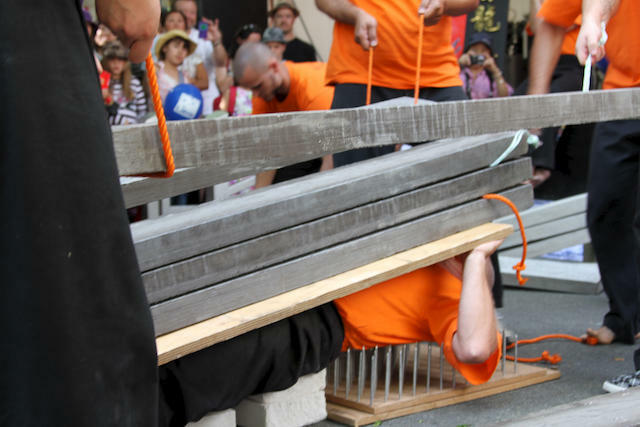 The requirements for the Guinness World Record® are very specific, and include that the nails used in the bed of nails must be 6" long, and spaced 2" apart both ways. It took two and a half years, and a great deal of Chi training, with several attempts at increasing weights before Master Hardy was ready. Early in 2008 he found that the record had increased to 511.88 kg (from the 300 odd kg he had trained for) , but decided to proceed, and rapidly trained to be able to hold that weight – over half a tonne. 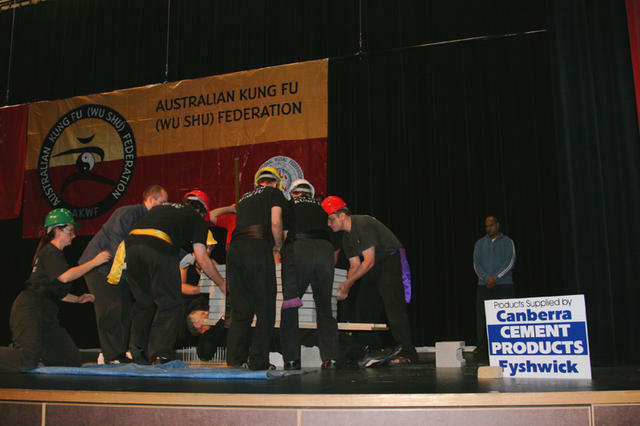 The attempt was set for 16 February 2008, at the Martial Arts Expo of the 2008 Australian Kung Fu (Wu Shu) Championships, itself held in conjunction with the National Multicultural Festival, in Canberra. Master Hardy and his Fire Dragon team had a total of four demonstrations over the weekends of the 9th to 10th and 16th to 17th February. On the first demonstration, he broke his right arm, and despite spending a couple of nights in hospital having a plate inserted, was still determined to proceed with his attempt at the record. 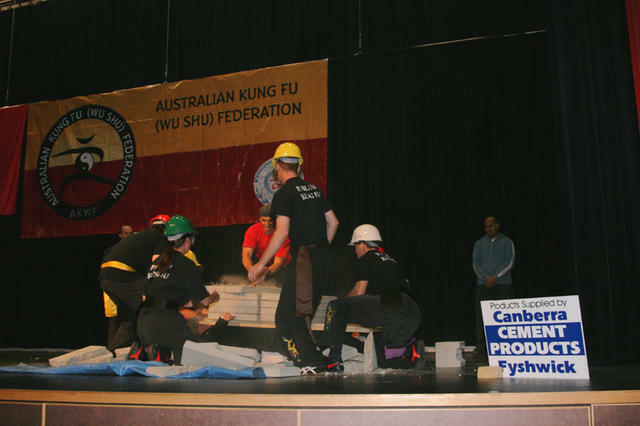 On the night, he and his team (which included Sifu Zopa Gyatso and Sifu Dr Wilson Lo as observers, and Sifu Jamie Coates and Neil Pearce from Sifu David Crook’s Bac Fu Do School) prepared the concrete and bed of nails, then Master Hardy prepared himself, with Chi Gung. He broke a small stack of 6 concrete edging slabs with a palm strike from finger tip range – with his left hand!, and then lay down on the nails. A total of 532.3 kg of concrete was piled on top of him, before Shr Fu Patrick Bellchambers set about breaking it up with a 14lb sledgehammer. At the end, Master Hardy stood up and saluted his helpers and the audience. 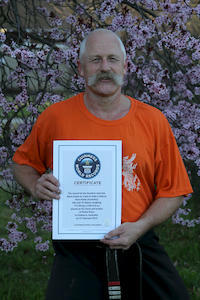 A few weeks later, he had official notification from Guinness World Records® that he is the new holder of that record. 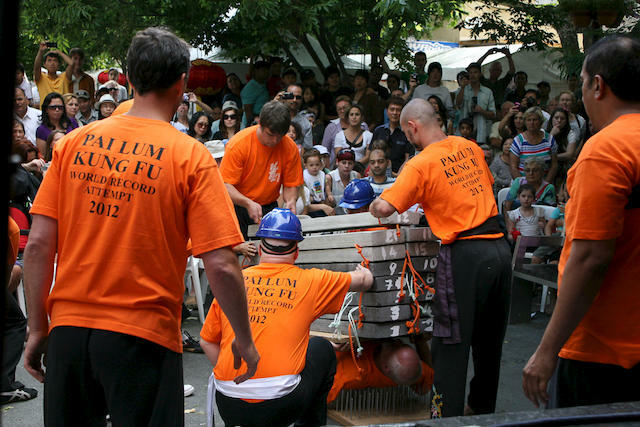 Master Hardy supporting over half a tonne of concrete on the bed of nails while Shr Fu Patrick Bellchambers smashes the concrete. 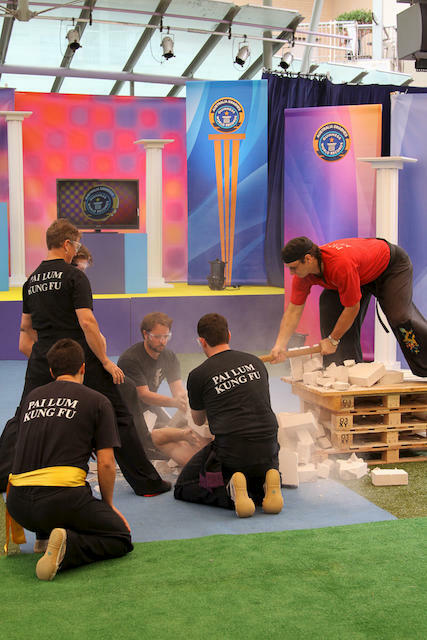 Master Hardy was contacted in January 2010 by Channel 7 TV, with the news that a couple of Kiwis had beaten the Fire Dragon World Record for the fastest time to have 16 concrete blocks broken on a chest. Fire Dragon was invited to travel to Sydney to see if we could regain our Record. 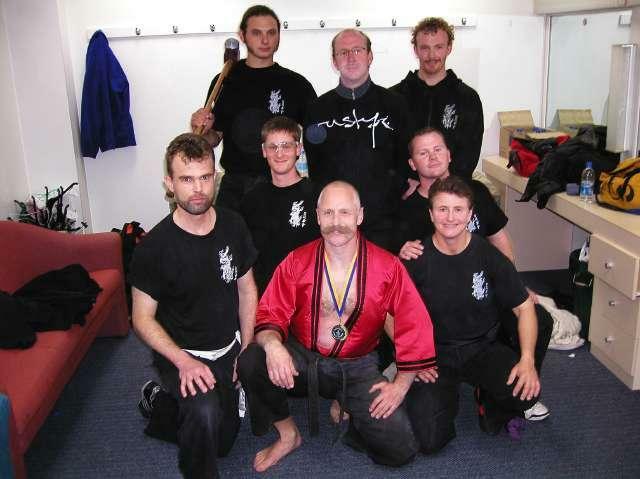 There wasn't much time for practice - a mere two weeks, so Master Hardy assembled a team and everyone started practicing, after normal training, and with only poor light available . 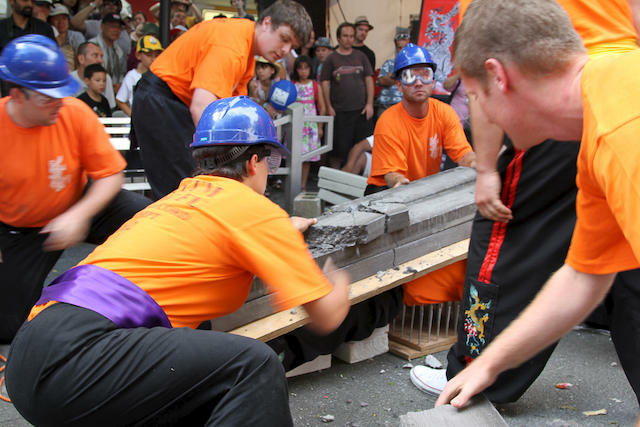 A new techniques was required, but while the team was developing this, Wasu Ingrid Bean had a finger caught between concrete and the 14lb sledge hammer. Her reactions, with those of Sifu Bellchambers on the hammer, saved worse damage, but Wasu Bean's finger needed hospital treatment, and she showed great courage. 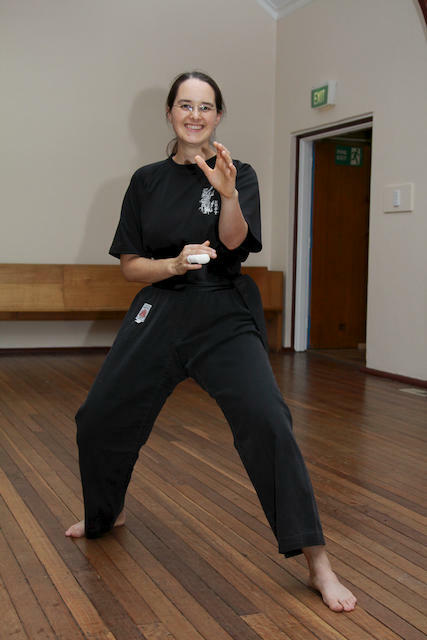 Sifu Ingrid Bean, in action again despite her injury! With her encouragement, the team decided to continue with the attempt, and including Wasu Bean, drove down to Sydney on 15th January. As a prelude to the main Fire Dragon event, Wasu Scott Savage tried his hand at his own World Record - breaking eggs with his head. He had no training time, and half an hour to prepare. 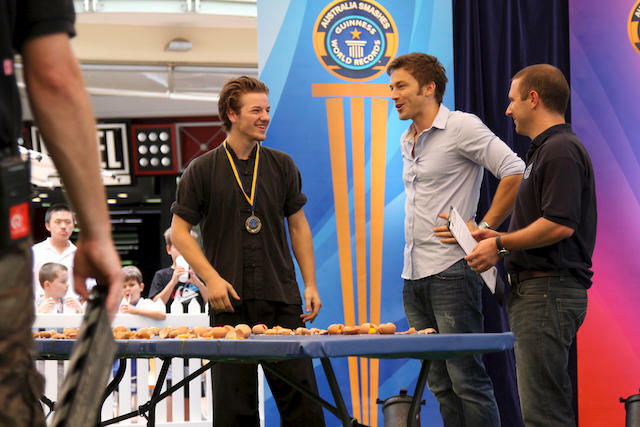 But he worked out how to use his Kung Fu, and broke the World Record - breaking 67 eggs in 30 seconds - a mighty effort! 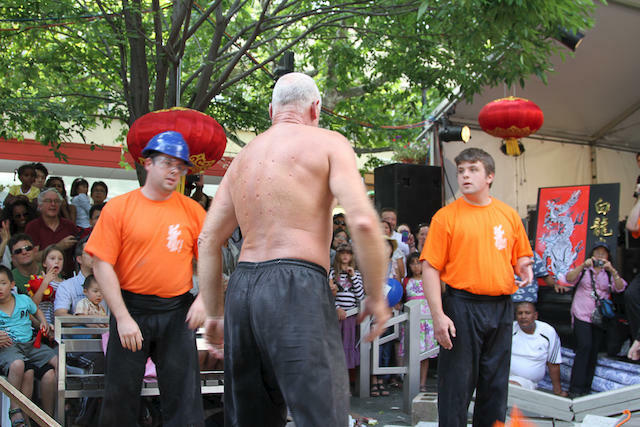 When it came time for the Fire Dragon team to perform, it took a little adjustment to ensure the best chance of success, and then Master Hardy lay down, and the team put the 16 blocks on his chest. 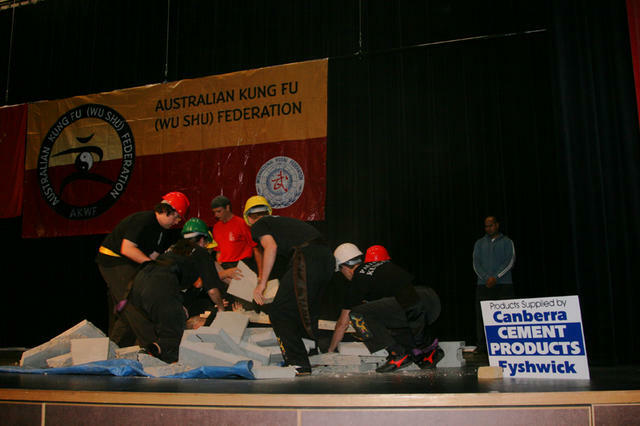 He gave the OK, and Sifu Bellchambers swung the sledgehammer while the rest of the team removed the blocks. 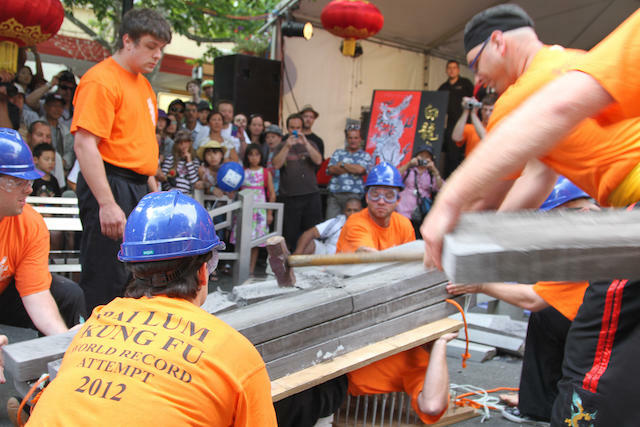 The attempt finished 7.37 seconds later, and Fire Dragon had regained their record, confirmed by Chris Sheedy, the Guinness World Record™ adjudicator. 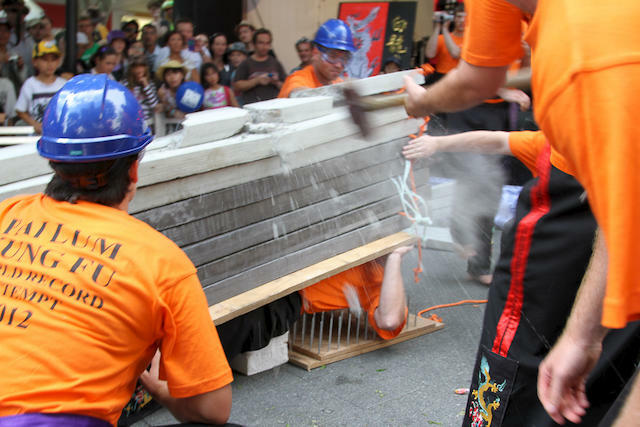 The Year of the Dragon commenced in February 2012, and now Grandmaster Hardy decided it was time to have another go at his Record for the amount of concrete he could have broken on his chest while lying on a bed of nails. He checked with Guinness World Records, and his Record still stood (at 532 Kg). 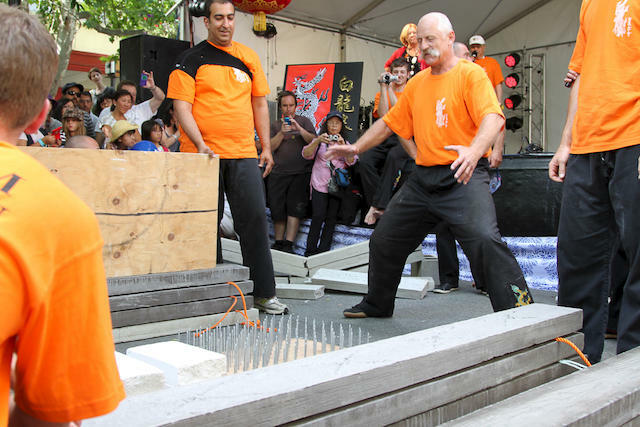 When he achieved that Record, he felt he could do more, and now was the time to try: he organised with the National Multicultural Festival in Canberra, and specifically with the Chinese Community, to make the attempt at the Chinese New Year celebrations on Sunday 12 February. 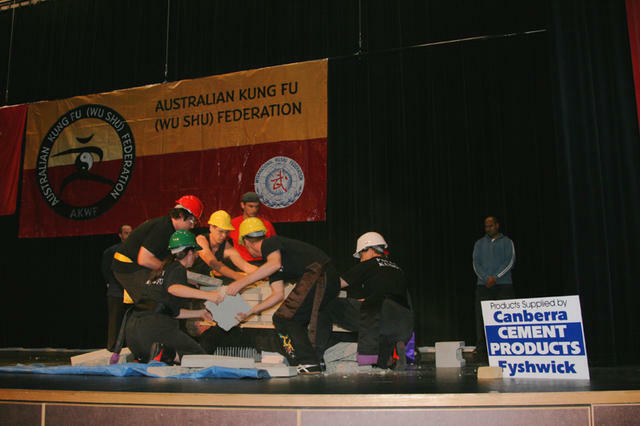 With the encouragement of the Chinese Community, and particularly Mr Sam Wong AM, Grandmaster Hardy prepared himself and his team. 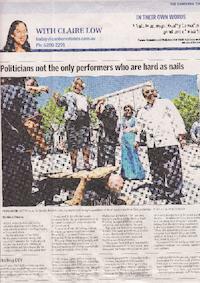 In the weeks before the record attempt, they worked out how to meet the demands of the attempt (having had thick concrete strips made specifically by Fyshwick Cement), and publicised the feat - and the Festival itself - by having ACT Minister Joy Burch stand on his chest while lying on the bed of nails. The Canberra Times article showing Minister Burch on Grandmaster Hardy's chest. 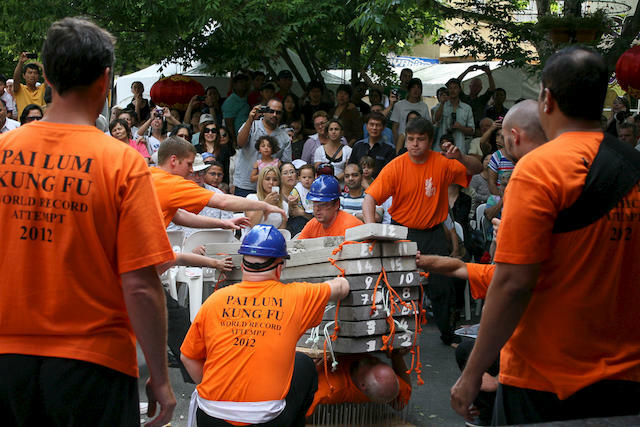 The attempt required a large number of participants - to load the concrete on his chest and remove it when broken; to stabilise the stack on his chest; to measure and record, and to act as independent judges. major public festival! 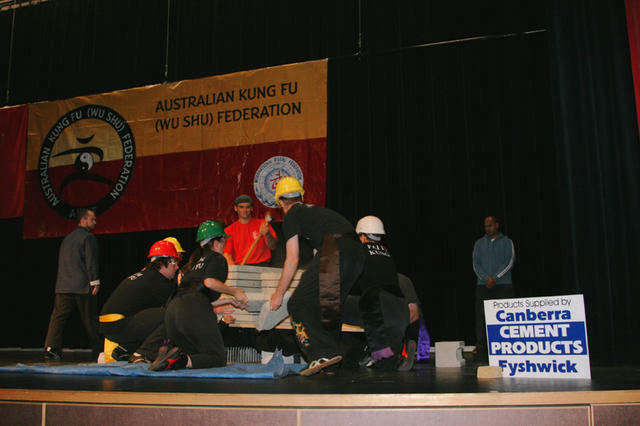 While Grandmaster Hardy had originally planned to make the attempt on stage, the weight of the concrete and performers was more than the stage was rated, and so had to adjust to working on the concrete area in front of the stage. And as the finale to the Chinese festivities, the team got down to business! The bed of nails was laid out on the ground, with concrete to support Grandmaster Hardy's legs. The concrete slabs had been weighed and numbered, and were stacked beside the bed of nails, with the sledgehammer nearby. 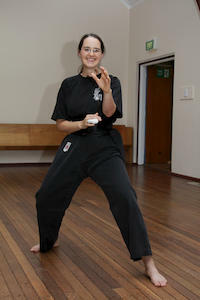 Grandmaster Hardy then started some serious Chi Gung exercises to prepare his mind and body. Grandmaster Hardy had not calculated exactly how much concrete he was prepared to have loaded onto his chest, and just brought all the slabs he had (15) and told his team to keep on loading them until he said stop. Concrete is being loaded on - at over 50 kg a slab! The last slab goes on. Well, he didn't say stop, so all 15 went on his chest, and then the sledgehammer went to work. A short time later, after a bit of shouting, Grandmaster Hardy was helped to stand (it is awkward getting yourself off a bed of nails! ), and Sam Wong announced the total - 774.99 Kg! A weight off the chest! Minister Burch and Sam Wong congratulated Grandmaster Hardy, and he thanked his team - it was a real Fire Dragon Family effort. 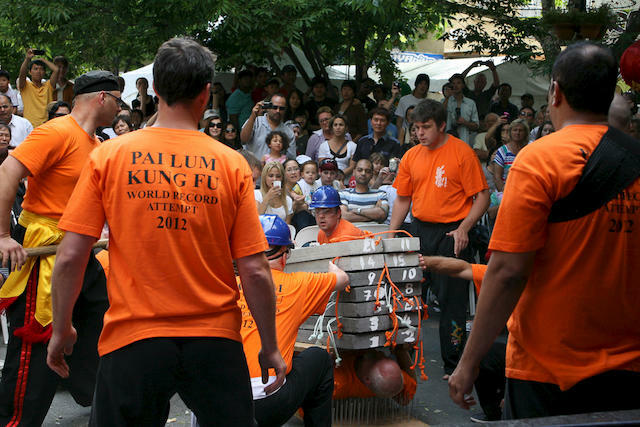 Record of 774.99 Kg concrete broken on the chest while lying on a bed of nails!